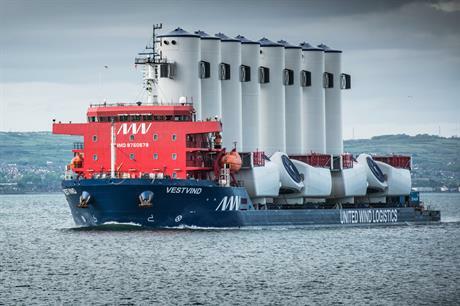 DENMARK: Manufacturer MHI Vestas has chartered a large vessel from United Wind Logistics (UWL) and has commenced shipping components for the Walney Extension West project in the UK. UWL will carry out full engineering services on the vessel, which includes supplying personnel and sourcing frameworks and fastenings for the Vestvind. The vessel will be solely available for MHI Vestas operations and has been equipped to transfer the major components for the up-to-9.5MW V164 offshore wind turbine. "The challenge of developing the most efficient and safe solution for transporting all V164 components, while reducing cost, has been very exciting. The Vestvind, as the logistical solution, is the result of our joint efforts and close partnership with MHI Vestas," said UWL managing director Lars Rolner. Components for the 330MW Walney Extension West project, developed by Dong Energy, have started to be delivered to the base port in Belfast ahead of installation later this year. Last year, offshore rival Siemens revealed its roll-on, roll-off vessel solution for transporting turbine components.